Today's post is to provide the instructions for constructing the Long Sashing. As noted in Step 25, I will need to make 18 Long Sashing. Step 25: To make the LONG SASHING, sew the Grey (L) WOF strips and Background (A) WOF strips together. Cut into 1.5” wide units. 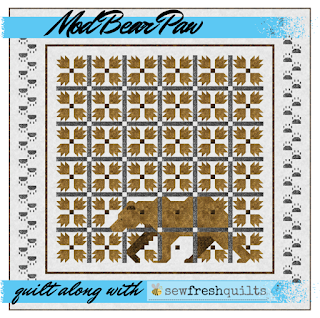 If you are making the BABY or CRIB size quilt, you will be able to skip the BEAR PRINT Border Blocks section that comes next, and wait for the QUILT ASSEMBLY instructions on October 29th. For those who are joining in the quilt along, I have decided to have a linky party where you can share your progress throughout the quilt along. So if you have finished your Bear Paw blocks and made your sashing, you can link up here! I'm finally getting some space to be able to get a move on with your quilt along. I've mastered 8 at a time 1/2 square triangles and I should get to the bear paws tonight or tomorrow. So many teeny tiny pieces Lorna. I'm enjoying this a lot but have not quite caught up yet...hopefully that is just around the corner!!! Thank you Lorna. Where is says, "Make 18 LONG SASHING for the BABY 39” x 47”", does that mean make 18 long sashings where each sashing has an L piece and an A piece sewn together?